IAM President Tom Buffenbarger called for a global aerospace union at the International Metalworkers Federation’s (IMF) Aerospace Workers Conference in Seattle, WA. 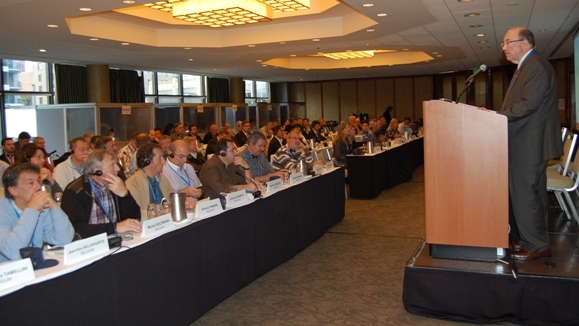 International delegates to the International Metalworkers Federation’s (IMF) Aerospace Workers Conference in Seattle, WA, IAM unanimously approved a proposal, made by President Tom Buffenbarger, that called for the formation of a global aerospace union alliance to address the increasingly multinational nature of the aerospace industry. Buffenbarger serves as the President of the IMF’s aerospace activities and chaired the meeting. Then IAM Conference in Seattle was hosted by the IAM and attended by more than 100 union representatives of aerospace unions from North America, Asia, Europe and South America.